Roger Brook - the no dig gardener: Fertilisers degrade your soil; myth! I makes my blood boil when I read that using fertilisers will damage the structure of my soil. I will accept the more vague notion that misuse of fertilisers might damage soil. I concede further that some gardeners so misuse fertilisers that damage to their plants is almost inevitable. I must define fertilisers so we can agree on our subject. Fertilisers are concentrated sources of plant nutrients. So defined they do not include manures, compost or other bulky organic matter. Fertilisers may by organic or inorganic. Bonemeal and dried blood are organic, superphosphate and growmore are inorganic and might be dubbed ‘chemical’. Because many different chemicals masquerade as fertilisers I may have to qualify some of my judgements today! 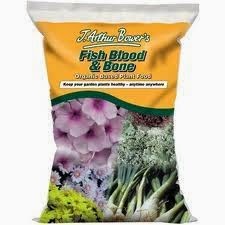 ‘Fish, blood and bone’ is an organic general fertiliser albeit it’s potassium is usually made up with inorganic potassium sulphate. The boundary between manure and fertiliser is sometimes quite close. I would regard this rich nutrient liqueur from a worm bin as a fertiliser on account of its high concentration. In a similar vein chicken ‘manure’ is best regarded as a fertiliser. The myth of fertilisers causing soil degradation I think arises because there is a very long history of farmers and growers relying on fertilisers to maintain high yields and over the years neglecting sound soil management practices. Excessive cultivation, soil compaction, failure to recycle natural organic matter all may be cited as evidence. Such practices undoubtedly do lead to loss of good structure. That in no way means that when I scatter Yaramila on my undug vegetable garden it will damage my soil in any way at all. Indeed I would argue that use of fertilisers can improve soil structure and otherwise benefit the soil. A plant short of nutrients and in particular nitrogen, will not grow very well. It will make less bulk. There will be less organic matter created than if fertiliser is given. Such organic matter responsibly recycled contributes organic bulk and leads to soil improvement. Most of the nutrients contained in a fertiliser if not used by the plants are retained in the soil. This is not true of nitrogen that is very readily washed away in Winter. Potassium and nutrients such as magnesium also leach if the soil is very sandy. Clay soils and soils high in organic matter retain such positively charged nutrients very well. Furthermore nutrients including nitrogen become part of the organic fabric of the soil. Phosphate scarcely washes in, never mind leaching out. Fertilisers lead to a build up in soil nutrient fertility. We frequently read of gardeners trying to reduce rich soil fertility to grow wild flowers! It seems to be very difficult especially regarding phosphate. Perhaps phosphate is the achilles heal in my argument. 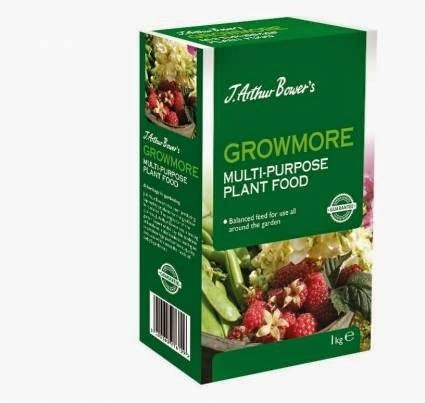 It is recognised that many gardeners and farmers have over the years over-fertilised with phosphate which in consequence builds up in the soil. I can’t resist suggesting that in gardens it is that wretched bonemeal again! In truth most general fertilisers have too much phosphate in their ‘analysis’. The US state of Minnesota prescribes a legal maximum of phosphate in any fertiliser sold! If you have a thing about fertilisers I hasten to point out that high soil phosphate can arise from manure too. As some reassurance I have never come across excess phosphate as a problem when advising gardeners. I have always been somewhat eccentric and as one of my lecture subjects used to be soil management, I have done unconventional things to my soil to see what might happen. For much more than a decade after I got the no dig bug I refused to import any external organic matter to my vegetable allotment. All offers of manure from horsey neighbours were declined! All the organic matter my plot generated was recycled (other than the tasty vegetables we ate!). Most of such fresh organic matter was merely left on the soil. I did frugally apply inorganic general fertiliser ‘top dressed’ on the surface around my plants. Every year I would quote in my lectures how my soil had developed magnificent structure and had become ‘black with organic matter’. One day I had to give an important lecture and thought I ought to have the soil’s organic matter properly analysed. The level was off the top of any normal scale! No dig gardening is now starting to be accepted. Most such gardeners still ‘don’t get it’ that you don’t actually need to import organic matter from external sources for the system to work! This is me being puritanical. Importing bulky organic matter is a speedy way of developing an organic rich soil structure and for most gardeners is the route to converting to no dig. The point of my story is that my annual use of inorganic fertiliser did not prevent my soil developing a wonderful structure and in my opinion contributed to its beneficial transformation. FYM is bulky and organic and is a manure and not a fertiliser. Its nutrient analysis is low but VERY SIGNIFICANT. Because of its bulk it adds substantial nutrients. A vegetable grower who applies it generously every year need never use fertiliser! I will include lime in my comments. Although the main use of lime is to raise pH and make a soil less acid or even alkaline, it is a fertiliser too. Indeed lime is widely held to improve soil structure. This might be disputed. The schoolboy lesson is to add limewater to a suspension of clay in a test tube. It immediately ‘flocculates out’ as the floating particles stick together. Some of us argue this gives a false impression as virtually the only time a soil is deflocculated is when it is flooded with seawater - as large tracts of south east England were in 1953. Some also suggest that lime improves soil structure because calcium is said to encourage worms. When the South coast was flooded massive amounts of sodium chloride were absorbed by the soil and its structure became a ruined sticky mess. The clay was deflocculated. Destroyed by a chemical it was restored with another. Very large amounts of calcium sulphate were applied to the soil. Calcium sulphate is a lime that does not raise pH and its calcium ions displaced sodium ions on the clay. The clay became flocculated again, the sodium was leached away by subsequent rainfall and the rest is history! This case illustrates that chemicals can destroy soil structure albeit in very exceptional circumstances. Asparagus is a maritime plant and some gardeners apply small amounts of common salt to it as a fertiliser. This may or may not be a good thing but for asparagus, sodium and chloride are regarded as ‘trace elements’. Many other plants can also utilise sodium and/or chloride as trace elements. For some it is an obligate need, for others it is optional. The thing about trace elements (in common with almost all chemicals we use in our life) is that small amounts are beneficial and even essential, larger quantities might be of no further consequence but very large doses are toxic. This applies to fertilisers too. ‘Salt’ can mean other things than sodium chloride. It is a term that includes chemicals that settle out of solution and some soils are saline which is not a good thing. Such soil salts may or may not be plant nutrients and may or may not have been supplied as fertilisers! Saline soils occur worldwide. In the UK problems are restricted to greenhouse soils where insufficient irrigation allows salts to accumulate. Old time growers - I mean those in my youth - would copiously water in Winter to flush excess salts out. Very few horticulturists including amateurs grow direct in a greenhouse soil now although I myself do. Greenhouse growers are sometimes caught out when salt sensitive plants such as lettuce cease growing and die. High levels of soluble materials in the soil restrict osmosis and plants ability to take up water. The most frequent occurrences of salt concentration problems occur when gardeners place highly soluble fertilisers close to delicate roots or apply too strong liquid fertiliser feeding. I have not exhausted all the examples of how soils, plants and fertilisers interact. Nor have I covered all the good and bad things about fertiliser use but have said enough for today. My comment that phosphate - causing water pollution - does not leach from a soil does not apply to leachate from a compost heap standing on a hard surface that might wash direct into a drain. Nor to decaying leaf litter lying on a road. Nor to soil physically eroded into water. My previous fertiliser posts can be clicked in the theme column. Because google only usually brings up the last four posts there are two clickable titles. I am always surprised when people thing synthetic fertilizers damage soil, but organic material doesn't. The nitrate, phosphate and potassium in both are identical. If one causes harm so does the other. For something to be called a Fertilizer in north America, it needs to meet specific labeling laws which grantee nutrient levels. So a lot of products are never labeled as fertilizer. They get labeled weirdly with things like "soil amendments - good fir plants". When I was at collage over 40years ago they were talking about poor soil management then. With little or none organic matter incorporated eroision and wind blow was a problem on light soils and things have only become worse. An interesting and very informative post. I don't use animal manure as we are on limestone and the garden is close to the well. I am afraid of contaminating the well. However I compost a great deal of leaves and will add a general fertilizer when it seems needed. Those were the days, shallow ploughing and loads of inorganic fertilizer, oh what fun we had until the yields dropped. I can just about remember flushing the soil in certain glass houses but the real challenge was the use of Hoddesdon pipes a major reason not to grow direct in the soil. We did have a useful cold house made of dutch lights which could be winched over three positions, ensuring that the soil was always open to the elements for a period of time, which was handy for salad crops. Digging in Hoddesdon sterilisation pipes was my first practical class I gave at Askham Bryan and we had mobile glasshouses at Wye college for chrysanth mum production. You have just refreshed my memory Roger, it was not just salad crops, I seem to remember that the system was used to cover chrysanthemums at the back end, however that doesn't quite gel with something that I know was true in that we used to do overwintered lettuce which invariably failed! Long time ago. I don't use synthetic fertilizers as my understanding was that they bypass the microbes and funghi whose symbiotic relationship is key to a healthy plant and soil life. Synthetic fertilizers just feed the plant and if nothing else is added to the soil, it will degrade, no? Whereas organic fertilizers will feed the soil life which in turn feed the plant.Is that wrong? Sorry, if I missed your point: it's late! Thank you for your question PA. I think you will need to read several of my posts to appreciate my philosophy of maintaining a healthy soil by minimum cultivation and building organic matter and in consequence encouraging such as mycorrhiza and earthworms. Nature 'feeds' the soil herself and the more you allow her to for example by recycling organic matter the less you need fertilisers - to the point of not needing them at all. Organic fertilisers - as opposed to manures - contain so little organic matter by virtue of their very low rates of application that their effect on soil organisms is barely perceptible. Sorry, I understand your argument now! Not sure what I was reading last night! All your myth-busting posts (the one on peat a while back especially) really get me thinking so I appreciate them a lot. Thanks for the reply even though I missed the point in my question! The note I make to myself is "don't make comments on other people's blogs after a glass or two of wine" l often regret what I have said!